If you’ve ever been a to Chicago Deep Dish pizza joint, you might have seen the “black” pans in which the pizzas are served. Most people don’t know this, but those pans didn’t start out black. 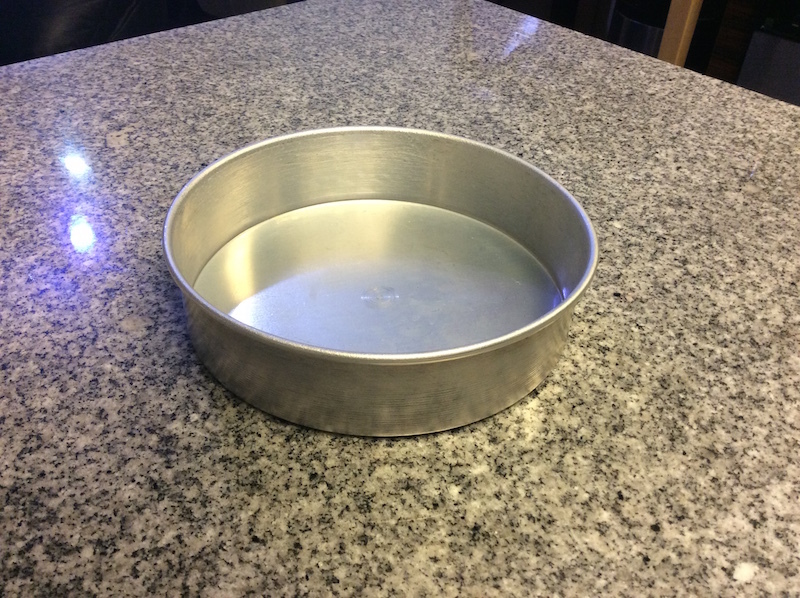 When new, most Sicilian and deep dish pizza pans are silver. As pizza after pizza gets baked, the pans get darker and darker until they look black. If you’ve just purchased a new aluminum or steel pizza pan, you’ll want to season before baking a pizza in it. We’ve received a few questions on The Pizza Bible community on the proper way to season a new pizza pan. The following article contains a step-by-step guide to seasoning a pizza pan. To get started we’ll need a pan and some oil. 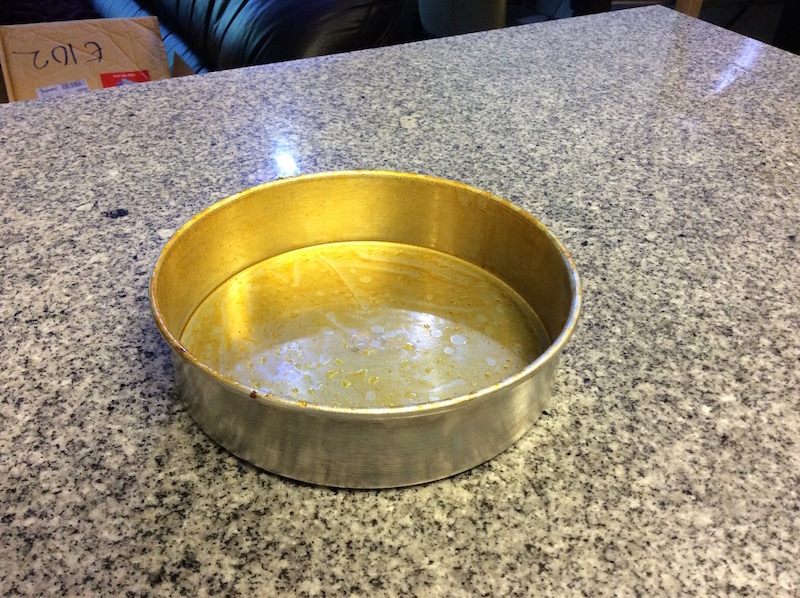 For our demonstration, we will use an aluminum deep dish pizza pan and canola oil. Canola, vegetable and peanut oil are great choices for seasoning. Do not use olive oil. It is not a suitable oil for seasoning because of the low smoke point. Preheat your oven to 450F. In the bottom oven rack, place a cookie sheet lined with aluminium foil to catch the drippings that will result from the seasoning process. If you’re using a new pan, check the product label/packaging to see if there’s a protective coating that needs to be removed. Often times, cast iron pans and woks ship with a wax coating, or a shellac, to prevent rusting. Start by giving the pan a thorough wash in hot water and soap. Rinse it thoroughly and wipe down. Place the pan in the oven for a minute or two to make sure it’s completely dry. Carefully remove it from the oven, allowing it to cool down. Once cool, place a small amount on the surface of the pan. 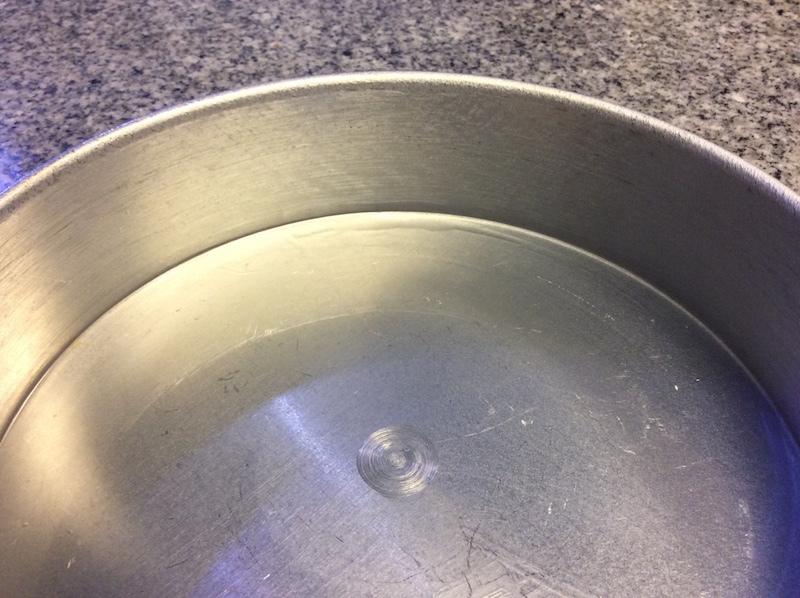 For the 9” pan we’re seasoning today, I used ¼ to ½ teaspoon of oil. Using your hand, spread the oil evenly. There shouldn’t be any puddles. If there is too much, use a paper towel to soak up the excess oil. The key here is to create a very thin layer of oil. Ok, we’re ready to go. Place your pan in the oven and set a timer for 45 minutes. Be sure to open the windows and turn on the fan. While the pan is in the oven, a strong burnt odor will emanate. This is normal. Remove the pan from the oven, allow it to cool down. Once the pan is cool, you’ll want to repeat the seasoning process two more times: coat the pan with oil and then bake again. 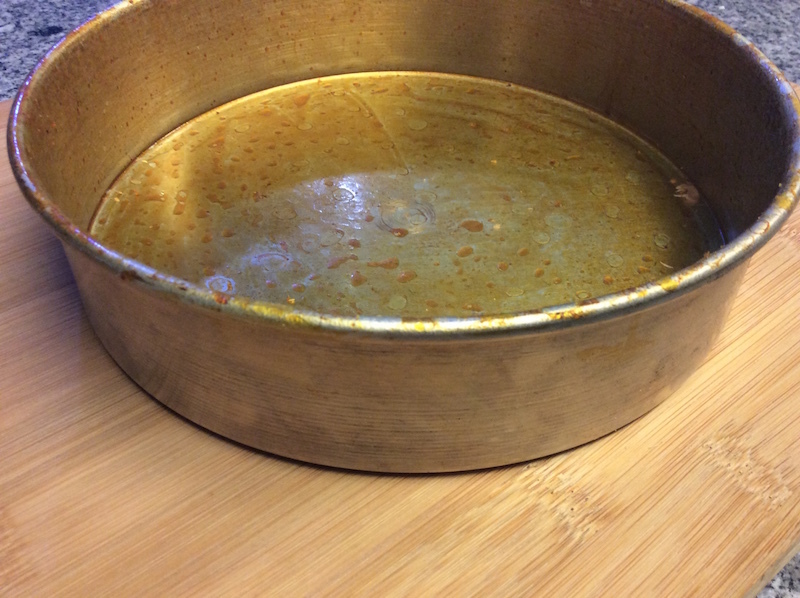 After the second bake, the pan will take on amber color. Typically pizzerias don’t wash their pizza pans. After cooling down slightly, they give it a wipe with a towel. 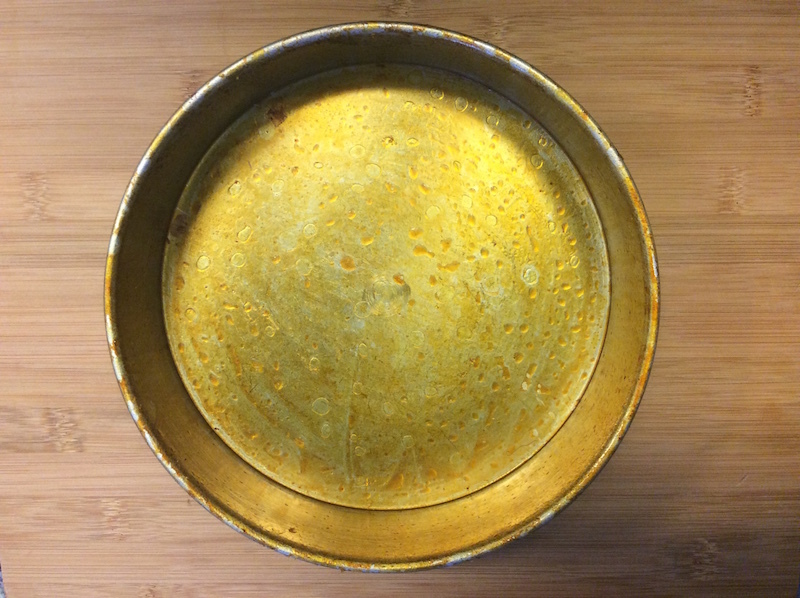 This removes any crumbs and other residue, but keeps the seasoning, or “patina”, in place. Over time, if the pan begins sticking, it might be necessary to repeat the seasoning process. If you have any questions, be sure to post in the comments below.